Right after this week's announcement of the breath-taking LG G3 (there goes our LG G3 hands-on), we published a poll, asking you which of the four major Android flagships of H1 2014 would you prefer. Naturally, we view the LG G3, Samsung Galaxy S5, HTC One (M8) and Sony Xperia Z2 as the four major smartphones in the first half of the year, so these were the only options present in our poll, since we didn't want to water things down. To tell you the truth, we expected the LG G3 to take the lead, as it's the newest handset of the four, with specs that are obviously a notch ahead of the rest (though, when it comes to the display, LG's lead is bigger). However, if we don't put so much emphasis on the 5.5" QHD screen of the G3, since the benefits of such high a resolution on such small a screen are yet to be proven, the G3 isn't that much better than its rivals, at least on paper. It has pretty much the same internals, but where we think it excels is the larger-than-life display, combined with extremely narrow bezels. Such a design makes for a handset that isn't significantly bigger than its opponents, but at the same time offers a maximized viewing area. So, while we did expect the G3 to have an edge over its rivals in our poll, we were actually shocked to see the staggering lead of the G3 over its opponents! With a total amount of 7692 votes — which is one respectable figure — we're also willing to believe that the results from our poll are quite representative of a relatively wide range of users. As you can see in the chart below, the LG G3 simply obliterates the competition with the whopping 55.36% of all votes. This comes to show that users are very impressed by what LG is putting on the table here. The very distant second in this race is the Sony Xperia Z2, with its 18.68% of this juicy pie. Then, the HTC One (M8) has managed to beat its rival the Galaxy S5, by grabbing 15.21% of the votes. Finally, it seems like Samsung's Galaxy S5 hasn't really managed to live up to the hype, as it has taken the last place in our poll, with the modest 10.75% of all votes. Of course, we don't really think these results spell doom for Samsung as a whole, since we can imagine that there may have been many users voting for other, more exciting handsets, just to express their general disappointment with the GS5, but not the Galaxy line as a whole. Still, the simple fact that the LG G3 has received more votes than all the other handsets combined, means that LG has definitely gotten something right here. M8 vs S5 vs Z2 vs G3: Which H1 2014 flagship would you prefer? just for a quad hd display!!?? You can read G3 specs. The G3 has not just a higher pixel density display, but a high quality IPS screen that is larger than its rivals, good OIS camera with what should be improved low light focus, 32GB flash / 3GB RAM on the top model, removable battery, etc. The drawbacks of the G3 are that it isn't water resistant, the headphone audio is probably mediocre, and the onscreen buttons sacrifice some of the larger screen. Overall, the G3 is a very solid phone with some of the top specs available today. I agree with that, it's a great device but it falls short in some aspects. Every phone does, in some aspects. You have to get what works for you. Customizable on screen buttons over permanent buttons any day of the week. Android had matured enough that they aren't in the way when it's important and LG had taken them to a step only available for custom roms. If you had a g2 then you'd know that its DAC was very good. Therefore without you or me having played with the g3 yet and based on the g2 I'd say mediocre headphone quality is false. Qualcomm's recent DACs offer good specs, but mediocre headphone output quality in most Android phones because the headphone amp is inadequate. "The LG G2 showed nicely clean output in both parts of our traditional audio quality test. The smartphone got pretty decent scores, but was led down by its volume levels, which were only average." The average volumn levels means that the G2 has a mediocre headphone amp and can't drive many higher quality headphones. If you read the various headphone forums, you will see that the G2 is not a good choice if you listen to music via headphones unless you use an external amp with it. The G3 is a monster of a phone, it has almost the complete package, but this poll means nothing in real world just like last year's G2 and G pro polls meant nothing to the people who don't go on tech sites. Last year the G2 won the poll and by a big margin, but guess which phone ended up selling the most? Yeah, you guessed it. From what I hear from the ATT staffers at the local store, it seems that "buttons on back" does not make for great sales. Maybe it is possible to get used to this, but in the store, how many potential G2/G3 customers will feel confident that they will get used to it? Probably just a few and the rest of the people who try the G2/G3 will end up with something else. True that, when my wife wanted the G2(before she got her Note 3) she was kinda skeptical about how she is gonna get used to those back buttons and I thought it was one of the stupidest choices LG has ever made, but it turned out to be a great feature which I don't mind OEM's offering it in their flagships, especially since all of them are now offering wide 5+" screens. People are always afraid trying something new, it's not LG's fault. For me, I don't like the layout of the buttons on a Lumia, I'm using a 925 for work/testing purposes and that dedicated camera button is irritating as hell. I keep pushing it accidently when I type. When I first got my g2 it took me a week to get used to the back buttons then they felt like second nature because that's where my pointer finger lays when I hold my phone anyway. Then when I got my gs5 the side buttons felt weird because I had to go back to using my thumb. I'm looking forward to getting back to a g3 for the back buttons. It feels more natural to me. For me the back buttons are a lot easier to press than the side buttons on my LG Optimus G. Back buttons are less prone to accidental clicks. It is really depressing when you press the phone lock button which rotating the phone from portrait to landscape and landscape to portrait. Not for the display but everything else. I'm excited for this phone along with some others. It's always fun to play with a new device. Sony has disappointed me in making the Z2 pretty limited in availability, especially for Verizon so the G3 fills that void. It's the bezel that saves the g3. Still going to stay with my z2. It's hard to play games with those kind of bezel. I'll have to wait for a camera comparison and review to be sure. So damn true. 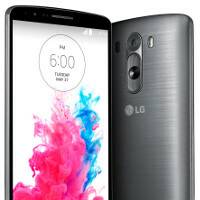 LG G3 is the best smartphone of this year, and the most beautiful.. Most beautiful? That goes to the M8. Best android phone? Well I believe the Z2 is, the ip58, stereo speakers, and 20mp camera says so. But that doesn't mean the G3 is far from it. The M8 looks same as the M7. So nothing new there and also 4mp camera -_- . The Z2 I agree is pretty awesome but Sony is unable to take advantage of it due to its very late release, its been almost 2months!! But G3 has some really cool looks, especially the screen to body ratio. A 13mp camera with OIS is surely more useful than a 20mp camera without OIS. The Z2 bezels are too big. The screen resolution is ok, but this G3 showed that we can go even further. So you see... it all depends on what's important for you. That said, even the Z2 is a great phone. Only it's impossible to say, in an absolute way, which is THE best. If you desperately needed a heart rate sensor, the best would be the S5. And so on. There are bunch of youtube videos that debunk the theory that OIS is a must, the S5's DIS proved to be better in those videos. I would take 20mp camera, ip58, stereo speakers, shatter proof glass over QHD screen. Well, for me it looks the best. For my eyes, the M8 looks awkward with those huge bezels.along side the G3, and I wouldn't even mind calling it a bit ugly. Yeah, I'm totally spoiled with those slim bezels from LG phones. lols.. And not to forget the awful camera on that M8.. :-/ Z2 would be my second pick but its uncomfortable to hold with a hand and also 20MP is just for the auto mode, and to use other minor manual functions the resolution changes to 8MP, well, that's totally weird. And btw, I do a bit of photography.. But as far as I've read and seen through videos, the G3 looks stunning, feels premium with the materials used, have a great camera, superb display and gosh the looks, awww (for me). AFAIK, 2014 isn't over yet. There's still 7months to go. i only voted casue screen to body ratio is a very important thing IMO.